Amanda Wilson is all geared up for an exciting gap-year, travelling across Europe but her plans thwarted when she is abandoned in France with a cellarful of Chateau Plonk, a large Space Hopper, and Old Ted, the dog, for company. Meanwhile, in Sydney, a lonely Todd Bradshaw realises that his first true love, Amanda, is the only woman for him. Can he get her back? Wyer's humorous books take a light-hearted look at getting older. Her book Grumpy Old Menopause won The People's Book Prize Award for non-fiction 2015. Carol has been interviewed on numerous radio shows. BBC Breakfast television' has had articles published in 'Woman's Weekly', featured in 'Take A Break', 'Choice', 'Yours' and 'Woman's Own' and writes regularly for The Huffington Post. She lives in rural Staffordshire with her grumpy husband and travels frequently to France. Good reading and very funny. One character reminds me of someone I once knew. What an awesome book! I hope this wins! One of my favorites of Carol's. Loved the characters in this one. Fantastic book, really good read ! This was my very favourite Carol Wyer book. Very funny in parts and gripping in others. If you haven't read it already you must. Carol E. Wyer's humorous writing is brilliant! 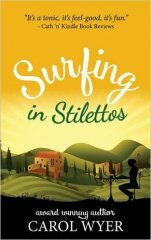 Surfing in Stilettos is the first of her many wonderful books ... I have re-read it many times and always find it uplifting, easy read. Perfect summer time book!! Loved this book. I was my "book of the year". I really hope it wins. Good luck Carol. This is a book you really should read. It's perfect for a holiday. I loved it. I can't believe the stuff Amanda's mum gets up to and I adore Bibi Chevalier who wanted to catch out her cheating husband. Great book that made me lauh on many occassions. I associate with husband Phil! Love Carol's humour. This was my favourite book. I want to buy a campervan and travel to France after reading this. Fantastic fun read. Enjoyable book set in one of my favourite regions in France. Fast paced, different and extremely funny. Good luck Carol. This really deserves to win. One of my favourite reads from Carol. It follows on from Mini Skirts and Laughter Lines but can stand alone. Very funny book. Also comes with a grim message about the dangers of the internet. Jolly well deserves to win. A hugely entertaining read. Highly recommend it. Loved this book! Bibi is hilarious and so is Amanda's mum. It transported me to France and to warm sunshine. Ideal for a grey British Summer's day. Conjures up France perfectly while making you laugh. Easy read and leaves you with a feel-good factor afterwards. Might put you off ever travelling in a campervan though!